Some latest news, appearances/participation in events are here. Here and (much more) in social networks. » 24 february 2019, Vilnius, LT - 8 Movements Symphony by Musical Blockchain, synchronized with dynamic lighting was presented during the opening of "Madonna" spiritual installation in Švč. Mergelės Marijos Ramintojos church. Also, first-ever public rendition of Musical Blockchain-composed tracks happened during the opening. Compositions from 8 Movements Symphony was exclusively played LIVE by musicians from Lithuanian National Philharmony and other internationally-known professionals. Symphony's new angles and meanings opened with a touch of their talent and improvisation, showcasing the next level of a computer-human Creative Collaboration. » 15 february 2019 - Musical Blockchain included in a recent report by Deep Knowledge Analytics. » 09 february 2019, Vilnius, LT - Music, composed by Musical Blockchain was played live on a private presentation event by a string quartet and guitar on 09 Feb 2019. It's a world's first rendition by a real musicians of a tracks, composed by computer, inspired by real Art piece (and not a randomly generated calculation). » 02 november 2018, Vilnius, LT - Due to high demand, TWO additional live performances with a "Vilnius: the Other Side" exhibition soundtrack happened during Max Frei's "Night Vernissage" special event. » 21 october 2018, Vilnius, LT - "Vilnius: the Other Side" exhibition soundtrack was presented live during the opening of Max Frei's exhibition of the same name. Soundtrack album is scheduled for release in March 2019 on Spotify and other streaming services. » 17 october 2018 - New album "Portals and their Inhabitants" is OUT NOW. An album, created/generated by Musical Blockchain software solution, using images as an inspiration for Decentralized Improvisation™. 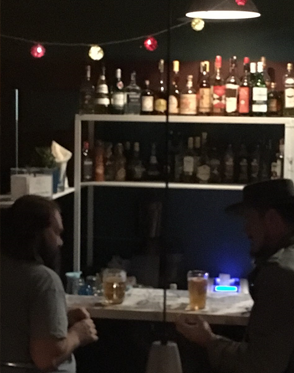 15 october 2018, Vilnius, LT - Mini-tour "Pleasant, Unexpected!" kicks off with the exhibition opening: facebook.com/events/730612877288030. Be sure to follow our social medias! 26 july 2018 - To show the love and respect for our favorite artists/bands, every thursday we'll generate a track and share it with a small story+details and call it #ArtistRespectThursday (and yes, it's #art short). Moreover, we encourage everyone to show the love and respect for their favorite artists with a piece of own art and post it every thursday with #ArtistRespectThursday tag. 20 july 2018, Vilnius, LT - We are thrilled to announce our long-term cooperation and partnership with a fantastic bestselling author Max Frei! 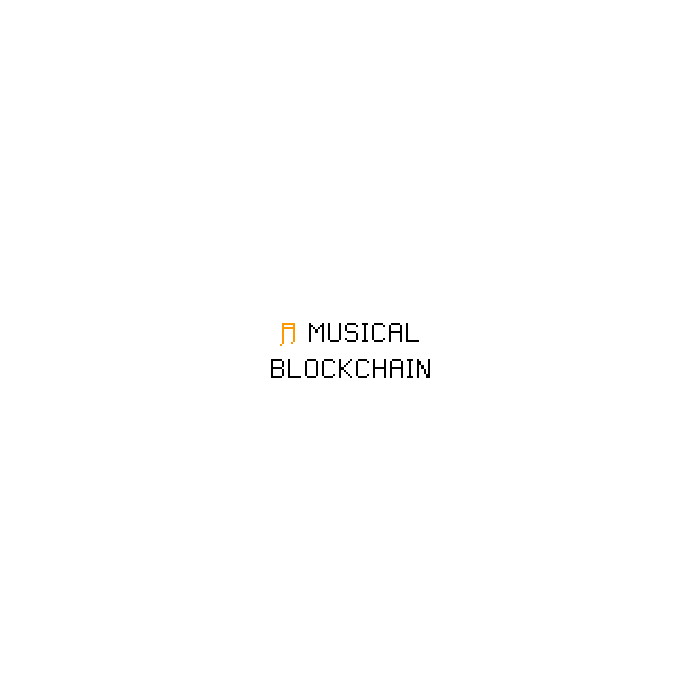 Hello and welcome to Musical Blockchain's official page. Here you will find info about Musical Blockchain, what it’s all about, demonstrations and a lot more. If you would like to learn only the dry facts of Musical Blockchain - download a whitepaper and refer to the FAQ section. Bookmark us and check back soon - more interesting things on the way. Plus, be sure to follow us in social media. Long story short: we created a solution which takes your data and converts it into musical composition, building it tone-by-tone using the AI+blockchain concept. Short story a bit longer: we invented a way to process user-submitted data and use the results of data analysis as a natural inspiration for melodic sequence composition, using the AI+blockchain concept; we are proposing new fundamentals for machine improvisation to be used in the composition process. We define musical composition as a chain of linked blocks. For technical insights on the process - download the actual whitepaper. As it happens in real life, the creation process usually starts with natural inspiration. We use analysis results of user-provided data to create a basic inspirational set for nodes. Then, the network of nodes start a tone-by-tone melody building process, secured by harmony. The resulting blockchain contains multitrack composition, that can be exported in a human-audible format. Pretty simple and clear - like a band in studio. Now that we quickly passed a boring part, let's dive into some examples. We really don’t want to be boring here so we took some real life samples and worked our magic on them. The sounds were rendered from generated MIDI files with standard MIDI soundbanks. All rights to pictures and texts belong to their authors or legal owners. All rights to melodical compositions belong to the Musical Blockchain team. This is a base melody technical demo tracks. More examples coming soon. Follow our social medias to get latest news. A picture. 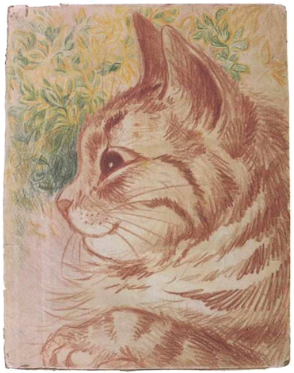 "Cat" by Louis Wain. A text. "Jabberwocky" by Lewis Carroll. A painting. 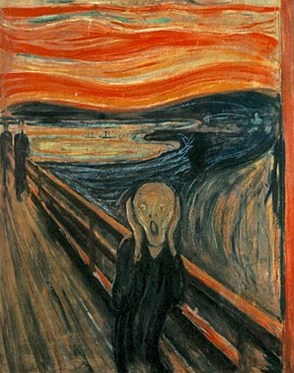 "Scream" by Edvard Munch. A photo. "Filosofija 1:00am" by Musical Blockchain team. Sounds like a melody, doesn’t it? Same photo. "Filosofija 1:00am" by Musical Blockchain team. More examples, albums and collaborations already available on our Soundcloud. Q: Wtf are you doing? A: Hey, thanks for asking! We’re doing a Musical Blockchain thing; a software solution that will take your data and convert it into melody. Sounds thrilling? See some examples. Q: What this product is all about? A: First of all, let's not call this a product. It's a software solution that have appliances in music, city development, art, education, medicine and other areas (refer to first half-year overview for a list of launched projects/initiatives). It works with data and generates melodic sequences building it tone-by-tone using blockchain+AI and other unique in-house developed methodologies. A: Because we see that blockchain and music are the same concept. We define musical composition as a chain of linked blocks. You can find more details about our vision in the whitepaper. Q: Are you mining music? A: No. We took the original blockchain concept, stripped out the mining part, made our changes and invented our own methods for data analysis, plus new fundamentals for computer improvisation. If the Musical Blockchain term doesn't fit your needs and you need another additional fancy label instead - you can use Decentralized Improvisation™ while describing composing process. Q: How is this better from using a central server? Why is it necessary, other than computing all as a network? A: Nice question! This is kind of like, "Is it better to compose alone, or with a band in a studio?". There may or may not be tons of pros and cons. But that's our way and our innovation, we see it like this and we think that it's more efficient. And yes, personally, we prefer to create altogether in studio. Q: So, you are using AI for it? A: Machine-learning models, pre-trained on existing tracks are NOT USED for any sequence generation. We utilise machine learning algorithms for the data analysis and deep learning. Q: Why do you think it will be successful? A: It depends on what you call "successful". We already have requests for partnerships and collaborations from interested parties worldwide and soon we'll be ready to reveal some details. Does that count? Btw! Take a look at our half year highlights overview, to be more on a subject, while judging. Q: Are you doing an ICO? Q: This is all so crazy and exciting! Love it! How can I support you? Q: What are the top 10 favorite music artists/bands influenced you the most? A: The list is much longer than just ten names; it's even too long to post. Let's set it like this: every time you'll visit this FAQ - you'll get random 10 artists + 10 bands out of our global list. To show the love and respect for our favorite artists/bands, every thursday we'll generate a track and share it with a small story+details and call it #ArtistRespectThursday (and yes, it's #art short). Moreover, we encourage everyone to show the love and respect for their favorite artists with a piece of own art and post it every thursday with #ArtistRespectThursday tag. Here's a list of our resources, available on the net. Share, like, retweet, play, sing! The list is constantly growing, so don't forget to check back in a while. We believe that the tools for inspiration and boosting creativity will be your next best friend in the studio, on-stage, and at home. We believe that man-machine collaborations, and unique data-driven soundscapes will create a beautiful sonic experience. We believe that new technologies will change the concept of art, as photography changed it almost 180 years ago. We believe that technology can spawn a new generation of young musicians, utilising tools as tools, and not as a replacement for talent. We believe, that making solutions for a real world is the only way forward. © 2018, 2019 Musical Blockchain team. While you're doing ICO, we're doing music.